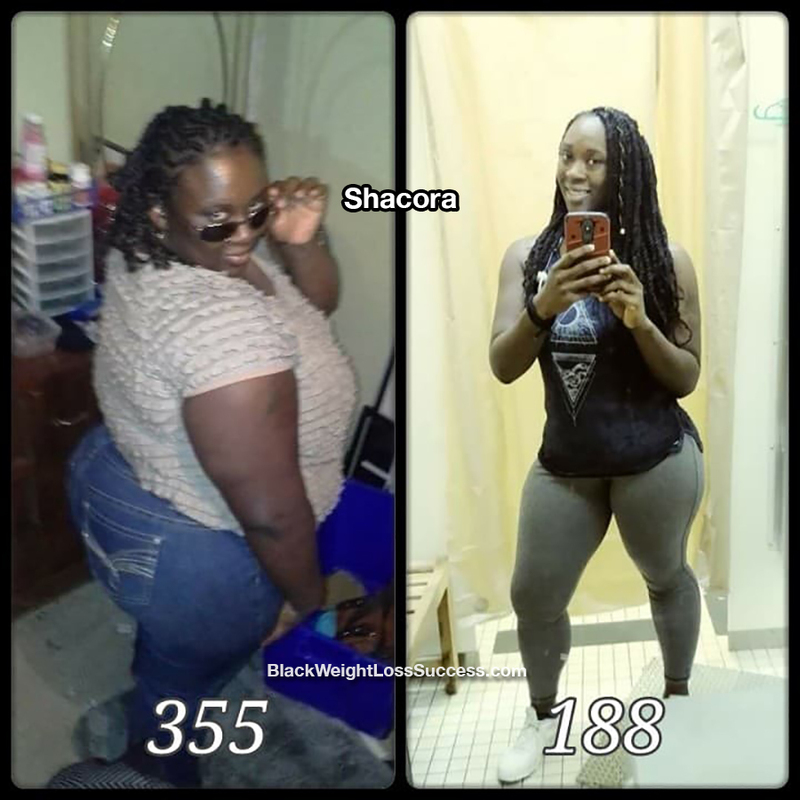 Update 2018: Shacora lost 18 more pounds for a total of 167 lbs gone. I wanted to update my progress. Since last being featured on your page, I’ve brought my weight loss total to 167 pounds. I am fully vegan now and I’ve become an online coach (along with preparing meal preps/plans). In July, I will celebrate 4 years on this journey. How have you continued to make progress? I have to lost weight by incorporating intermittent fasting and increasing my weight training. Changing to a vegan lifestyle increased my energy and helped me to sleep better. What new advice would you like to share with us? Always change up your routine periodocally. Our bodies get bored, just like our minds. Shock your system with new exercises and new food regularly. 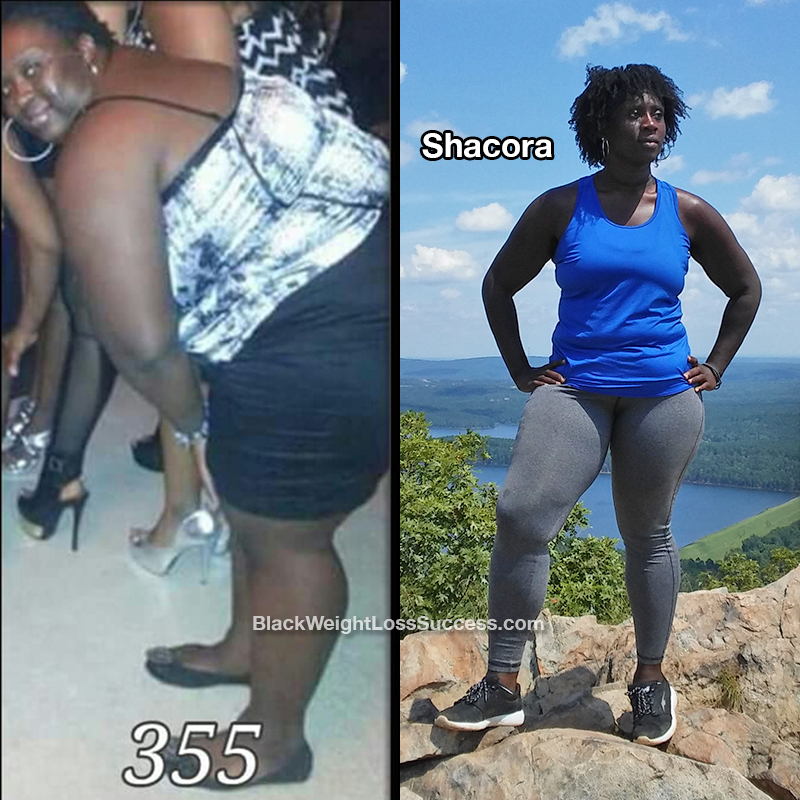 Transformation of the Day: Shacora lost 145 pounds. Three years ago, she was suffocating, mentally and physically. Thankfully, anxiety, depression and arthritis did not defeat her. She did her research, gradually became a vegetarian and fell in love with fitness. Check out her story. I started my weight loss journey three years ago (July 2014) at 355 pounds. My current weight is 210 pounds and my height is 5’5″. I hit many walls during my journey. There were times when I wanted to give up and stop exercising for a few months, but reflecting on the past would remind me why I was doing this. I was motivated by my son and my doctor. I was also motivated by the simple fact that I was suffocating, both mentally and physically, due to obesity. I was battling anxiety, depression and arthritis. I love amusement parks, but I was to big to fit on the rides. I also couldn’t walk long distances without feeling like I would pass out. My knees and ankles would swell if I stood on them to long. Finally enough was enough. I figured out what worked for me in terms of nutrition. I started researching meal plans and healthy foods. In the beginning, I cut out pork, beef, fried foods, sweets, chips, soda, juice, white rice, bread and pasta. I would have occasional cheat days. After a year, I cut out chicken and turkey, only eating seafood for protein. A year after that, I gave up meat altogether and adopted a vegetarian diet. How was exercise a part of your transformation? Workout Too and Fitness Blender videos on YouTube. In September 2016, I started going to the gym for the first time and instantly fell in love. Now, I attend my gym’s boot camp and Zumba classes. I’ve met wonderful friends and trainers there. We set goals for our group, lift weights together and push each other. I workout 5-6 days a week on average. My advice to others is to find out what works best for YOU. Listen to your body, do your research and never doubt yourself. This journey is more mental than physical. Of course, I have setbacks but this is my lifestyle now and I love it. Simply Wonderful, Keep up the Great Work!!! Thank you for sharing your story; it gives me hope that one day I’ll be successful at weight loss too. God Bless you for the stick-to-it-ness so many time we start and go back to our old habits,so you are an inspiration to us all. God Bless.